← “First Monday, First Person” turns 4! 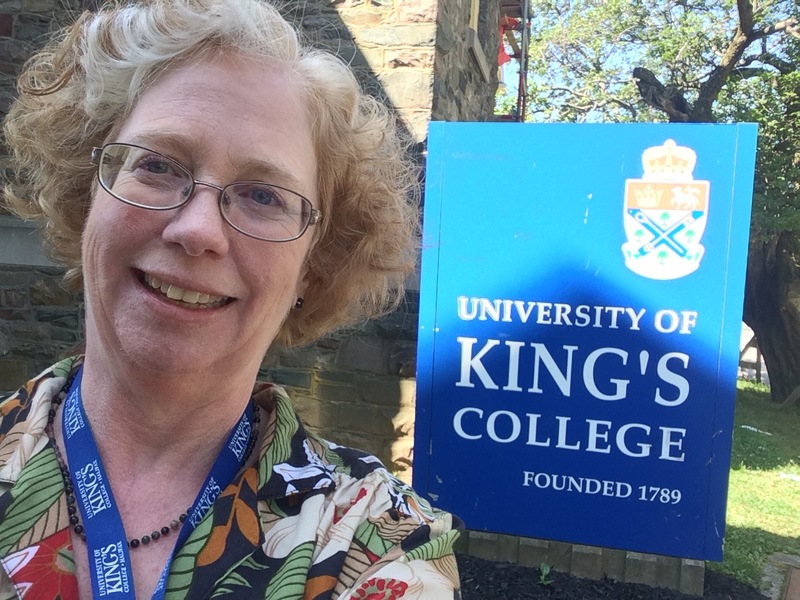 University of King’s College, Halifax, Nova Scotia, is not an easy place to get to from the Midwest. At least it wasn’t for me on my trip there in August 2017 to begin the residency portion of an MFA in Creative Nonfiction. “Inserimento” is Italian for “settling in,” literally, but represents much more than that. Inserimento is that step in the Hero’s Journey of crossing the gateway, of leaving the familiar world for the new and strange, where allies and enemies will be encountered. Inserimento sends travelers from the peak of Maslow’s Pyramid to its base, like a game of chutes and ladders. Inserimento is where the pursuit of self-actualization crashes into the search for basic shelter. In Toronto, the customs hall was so crowded that if I had fainted, I wouldn’t have fallen down. The line for the women’s bathroom at the entry point was 20 flushes deep. I queued for the toilets, queued for the immigration gate, queued for the student visa which the agent determined I didn’t need, queued to collect my bag. It took many questions and some waiting in the wrong queues to find my way from the baggage carrousels to the domestic departures area for the Halifax flight. I would learn later that this was the busiest day in history at the Toronto airport—a national 3-day holiday commencing that Saturday followed a construction error on Friday that severed a fiber optic connection, taking down the Internet for six hours on the Atlantic Seaboard. Planes could technically fly, but the airports couldn’t manage their passenger manifests without the Internet. The backup was slow to unwind itself. By the time I joined the throng on Saturday evening, the concourses of the Toronto airport were awash in travelers, many of them survivors of up to 24 hours’ imprisonment. My Halifax flight was delayed, gate-changed, delayed again, until the 50 of us waiting for it bonded into a family. We watched out for each other, dozing in shifts. Finally we got our boarding call at 3 a.m. The flight arrived in Halifax at 4:00 Atlantic time. By the time I had collected my bag, the daily shuttle buses were starting. “University of King’s College, Alexandra Dorm,” I said to the driver. “I don’t know where that is,” he said. “It’s part of the Dalhousie University campus,” I suggested. 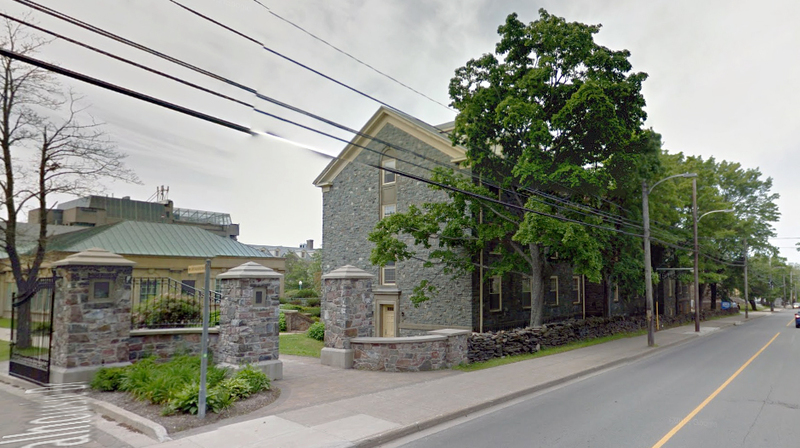 U-Kings had been given space on Dalhousie’s campus back in 1923, when its own campus burned to the ground. “On Coburg Road?” I checked the address on my dorm confirmation. Inside, the young man said he’d never heard of Alexandra Hall. “King’s College is out the door and to your left,” he said. “I’m a Dalhousie student, I’ve never been there.” I went back outside. The bus was still there, the driver in his seat, door open, but he avoided eye contact. Do I demand his attention, demand that he solve this problem? Or just accept I’m alone in the pre-dawn drizzle with my suitcase, a crime victim in the making? A runner jogged past. Although it was still dark I thought to myself. “If she’s running, we must be past the mugging hour.” I turned my back on the bus driver and headed downhill to the left, my wheelie case barking my calves. I came to stone gates, a driveway into a parking lot. I pulled out my phone, summoned Google Maps, asked for directions to Alexandra Hall. Google told me I was already there. That’s when I remembered the architecture I’d seen in the summer before in Oxford, England, where I’d first heard about this graduate program. The college buildings, arranged around quadrangles, turned their backs to the outside. That stone façade ahead could well be my destination. I just needed to find the door. I turned left and there was the façade I’d seen in a Huffington blog post about “the 10 most beautiful college dorms in Canada.” Up the steps to the door, up another half flight of stairs, and finally, a check-in desk. I got my key, learned that my home for the next two weeks would be on the fourth floor, and the elevator only goes to the third. At 6am, I turned the key in my door. By 6:05 I had closed the blinds, donned my nightgown, put my sleep-pillow over my eyes, and boarded the express train to sleepytown. Inserimento complete, when I woke I could begin climbing Maslow’s pyramid toward what I had come for—belonging, esteem, even self-actualization. But first I would have to find food. This entry was posted in Sarah's memoir and tagged #mfa, Inserimento, travel. Bookmark the permalink.